Jim Harrington is probably Cape Town’s best known Yoga Teacher. He started practicing yoga in the late 80’s to recover from injuries sustained while surfing, and taught his first students in 1994. Since then, he has applied his twenty plus years of experience to training and mentoring over 170 yoga teachers. Despite being called the “teacher’s teacher” around Capetown, his philosophy is that “Anyone who can breathe can do yoga. “ He still enjoys introducing yoga to the uninitiated and this has lead to him working individually with top athletes. As a new Graduate from UNSW, Jim was struck by a wanderlust and especially drawn to Asia. For 5 years he worked and studied with yoga masters in India and China, but then it was in Jim’s hometown, Sydney, that he found what he had been looking for. He gained Diplomas in Remedial and Sports Therapies and went into practice applying Yoga techniques along with Corrective Exercise and manual bodywork therapies. He has trained in a variety of Hatha Yoga methods, including the strict alignment based style of BNS Iyengar, the more dynamic Ashtanga Yoga, the Classical Raja yoga in the tradition of the Himalayan Institute. His teaching and practice is also heavily influenced by the Chinese forms of Chi Kung and Kung Fu. In the late 1990’s he trained intensely with Yoga Synergy, a more medical approach to yoga taught by Exercise Physiotherapists ( Yoga Synergy ) This synthesis of the ancient practice with contemporary thinking and research based science continues to inspire his approach to yoga and has been the key to the application of Yoga to Sports. In the summer of 2010/11, the Indian National Cricket Team hired Jim as their official Yoga Coach in a bid to improve fitness and mental focus. That same team went on to win the Cricket World Cup. Perhaps the yoga had something to do with it. He toured India with the Delhi Daredevils IPL team in April and May 2012 then again in in the Champions League in October 2012. Yoga for Cricket marks the start of Yoga for Sports – a Jim Harrington Yoga initiative. Jim conducted his first yoga retreat in a nature reserve in 2003, and takes great pleasure sharing yoga in idylic natural locations. Regular venues are the majestic Himalayas, to the exotic hills of Bali and an Silver Island in Greece. 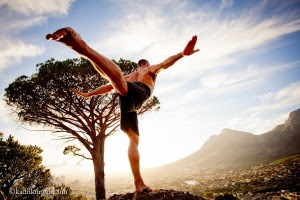 When in Capetown, Jim is working on 200hr and 500hr Yoga Teacher Training programs, teaching advanced workshops for yoga practitioners, running retreats, and developing specialist yoga programs for athletes and sportspeople.